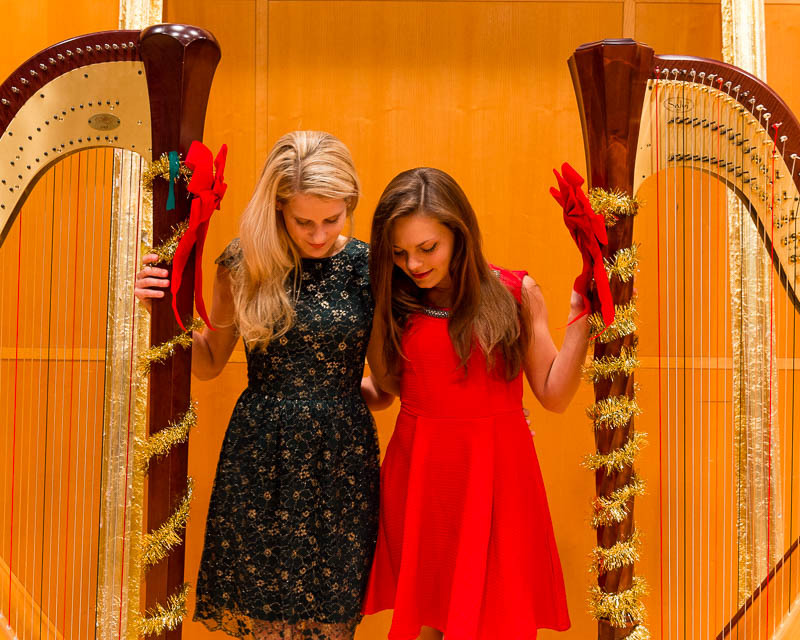 A unique harp duo that seeks to push the boundaries of the instrument through innovative collaborations, educational engagement, diverse programming, and other fun adventures. Since meeting in 2010, Paula Bressman and Rachel Miller have taken the harp duo to new and uncharted territories. Never afraid to blur genre lines, Beyond Pluck is equally at home performing masterpieces by Bach, Debussy, and others, as they are rocking their own arrangements of classic pop hits. The two bring enormous musical passion, and a sense of adventure to every project, and have been privileged to share their music across the United States as well as Puerto Rico. They've played their music in varied places such as art museums, churches, the streets of downtown Nashville, microbreweries and artisan distilleries, the forest of Tennessee, the Purple People Bridge in Cincinnati, schools, and concert halls. Beyond Pluck believes in the power of creative collaboration as a valuable tool to share the joy of music with a new and wider audience. The duo has worked with composers, drummers, scientists, visual artists, filmmakers, symphony orchestras, museums, and schools. 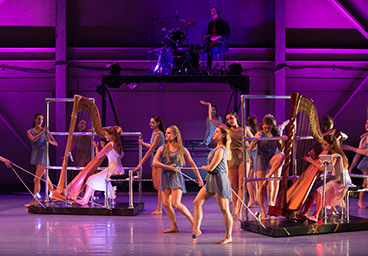 Recent projects include a rock dance show with the University of Cincinnati's Dance Department in December 2015, featuring live performance of many of Beyond Pluck's pop arrangements and choreography by Andre Megerdichian. 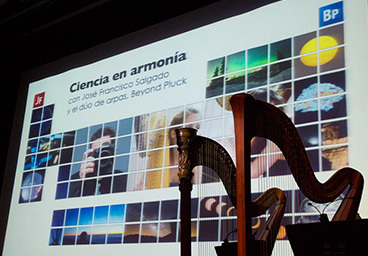 In May 2016, Beyond Pluck performed and recorded in Detroit, Michigan as part of the B Project, featuring three newly-commissioned works for harp duo, flute and percussion. In the science and visual art world, they have presented multimedia and multidisciplinary programs with astronomer and photographer / filmmaker Dr. Joseé Francisco Salgado, of the nonprofit organization KV 265 in the United States and Puerto Rico. 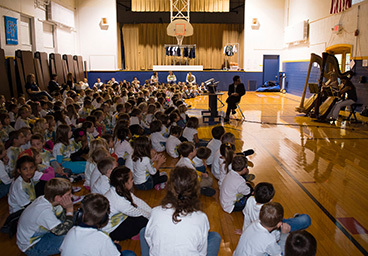 They have also worked with neuroscientists through their participation in a Music and the Brain Project, a partnership between KV 265 and the Feinberg School of Medicine at Northwestern University which culminated in a show at the Adler Planetarium in Chicago, IL. In February of 2016 Beyond Pluck was the guest on Classical Classroom, a radio show and podcast produced by Houston Public Media. Beyond Pluck has also been featured in Nashville Arts Magazine and the Harp Column as well as numerous blogs. Their recording of their arrangement of The Who’s “Baba O’Riley” has been played on radio stations nationwide in the United States and is featured on TalkTalk’s “This Stuff Matters” commercial in the UK. Rachel and Paula are embracing the medium of film, producing music videos of their versions of pop hits. The two have developed a strong fan base on their YouTube channel, and enjoy arranging their favorite music for harp duo. Beyond Pluck has fun in the recording studio, and their pop arrangements are available on iTunes, CDBaby, and Amazon. Paula, a native of Nashville, Tennessee enjoys an active and varied performing career. She is principal harpist of Orchestra Kentucky Bowling Green and Gateway Chamber Orchestra, and performs regularly with various ensembles including the Nashville Symphony Orchestra, Knoxville Symphony Orchestra, and Southwest Michigan Symphony Orchestra. Paula has also backed singer-songwriters in the recording studio and in the clubs of Nashville, and has added her signature warm and musically-sensitive style to several albums, including Jim Brickman’s 2011 album Romanza. A passionate music educator, Paula is Adjunct Artist Teacher of Harp (precollege and adult) at Vanderbilt University. She is also the harp faculty at Belmont University where she has developed the commercial harp major, teaches undergraduate and graduate classical and commercial harp students, and performs regularly as part of the Adelicia Trio (flutist Carolyn Treybig and violist Sarah Cote). Paula is also on faculty at Austin Peay State University. 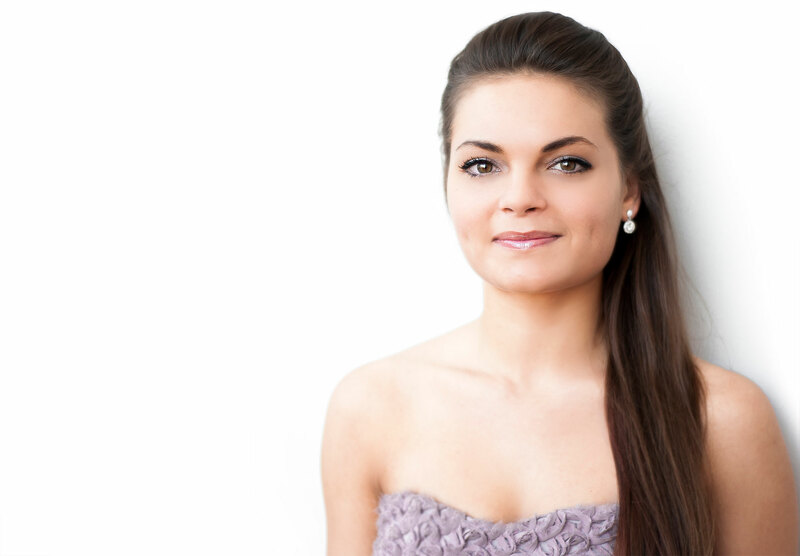 Paula studied privately with Licia Jaskunas before receiving her Bachelor of Music at Vanderbilt University’s Blair School of Music under the tutelage of Marian Shaffer and her Master of Music from the University of Cincinnati’s College-Conservatory of Music, studying with Gillian Benet Sella. Award-winning harpist Rachel Miller is celebrated for her dynamic qualities as both a soloist and as an orchestral harpist. She is principal harpist of the Southwest Michigan Symphony Orchestra and principal harpist of the Binghamton Philharmonic. Rachel has performed with the Detroit Symphony Orchestra, Cincinnati Symphony Orchestra, Columbus Symphony Orchestra, Charlotte Symphony Orchestra, Lexington Philharmonic, Ann Arbor Symphony Orchestra, South Bend Symphony Orchestra, and Kentucky Symphony Orchestra.She attended the Aspen Music Festival in 2014, and served as substitute principal harpist for the Lancaster Festival in 2014. Rachel was the winner of Cincinnati's College-Conservatory of Music Harp Concerto Competition in 2014, a recipient of the American Harp Society's Anne Adams Awards in 2010, and 3rd place winner in the American Harp Society's National Competition Advanced Division in 2011. In 2014, she performed François-Adrien Boieldieu's Concerto for Harp and Orchestra with the College-Conservatory of Music Chamber Players. She again appeared as soloist with the CCM Chamber Players in 2015, playing Maurice Ravel's Introduction and Allegro. 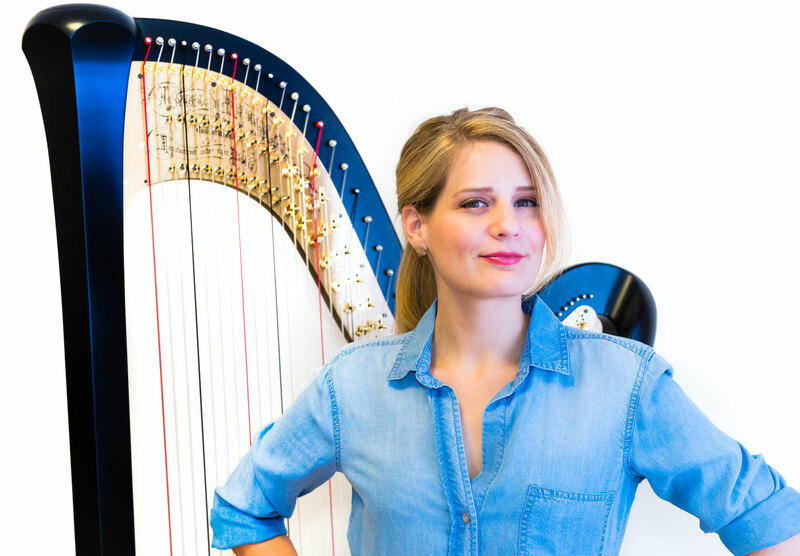 An advocate of new music, Rachel works closely with many composers on writing for the harp. She has premiered works by Phillip Sink, Evan Bushman, Michael Lanci, Dr. Jason Richmond, Evan Williams, and Daniel Harrison. A dedicated educator, Rachel maintains a private teaching studio in Cincinnati, OH, and enjoys working with students of all ages. During the summers of 2009-2012, Rachel instructed and counseled harp students at the Connecticut Valley Harp Intensive, in Simsbury, CT.
Rachel started playing the harp at the age of 8, studying with Susan Knapp Thomas. Her primary teachers include Patricia Masri-Fletcher, Arcola Clark, Kathleen Bride, and Gillian Benet Sella. Rachel received her Bachelor of Music in Harp Performance at Michigan State University, and Master of Music at University of Cincinnati's College-Conservatory of Music. 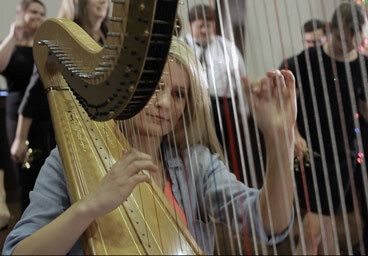 The first official Beyond Pluck music video for Baba O'Riley on two harps! Beyond Pluck's recording of "Baba O'Riley" is used in the latest TalkTalk commercial in the UK! It was fun to work with Leland Music. Beyond Pluck teamed up with Dr. José Francisco Salgado, KV 265, and the Feinberg School of Medicine at Northwestern University to explore the effects of music on the human brain. This short film was first presented by Dr. Salgado and Beyond Pluck at the Interim Meeting of the Neurosurgical Society Meeting in Chicago, IL on September 15, 2012. To learn more about this fascinating project read this blog by cognitive neurologist, Dr. Neelum T. Aggarwal. Harping On The Harp With Beyond Pluck! 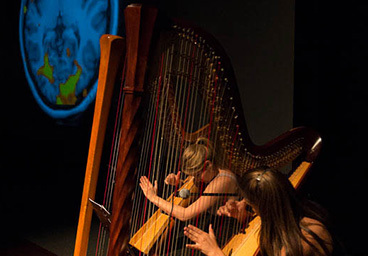 Beyond Pluck is a harp duo, comprised of Paula Bressman and Rachel Miller. In addition to the classical repertoire, they also like arranging pop songs for the harp, working with scientists and artists, touring clubs as well as concert halls, and long walks on the beach. In this episode, Paula and Rachel talk about the history of the harp and how it works, its repertoire, conjuring fairies, and why anyone would want to play something so ginormous. 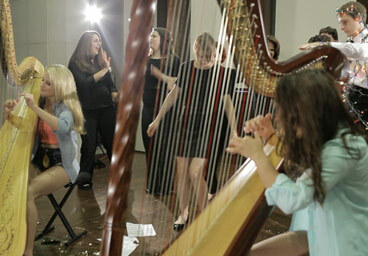 They also perform, illustrating the range of the harp, from Bach to Rihanna. That's right: we found harp in a harpless place. Their performances are studied and passionate, and I imagine an invisible line between them that tugs and gives at all the right moments. You might not consider a harp to be a very rocking instrument and you're correct. After all, aside from Florence + The Machine, the 5000-year-old string instrument, a favorite of cherubim and Calvin Candie, is not often heard in popular music. But Beyond Pluck is hoping to change that. 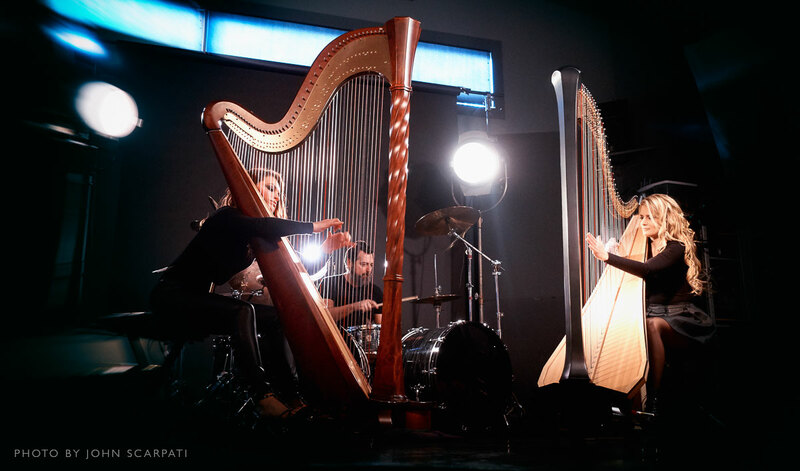 Harp duo Beyond Pluck, also known as Rachel Miller and Paula Bressman, present an ethereally beautiful cover of The Who's classic song "Baba O'Riley." I didn't know you could rock out on a harp! ST. JOSEPH - Paula Bressman met Rachel Miller in September 2010 at the audition to fill the harp vacancy in the Southwest Michigan Symphony Orchestra. "I looked up and saw this girl that was just a mess," Bressman says, laughing. "Her hair was wet and she looked a little crazed, but she still ended up winning the audition and I ended up coming in second." As I listened to KV265's presentation of "Music and the Brain" performed at the Neurosurgical Society of America meeting, and viewed the images on the screen, I couldn't help but wonder, "What does the rest of the audience think about what they are seeing and hearing?" "Are they wondering if the pattern of brain waves seen on the screen is happening in their own brains?" "Are their brains 'lighting' up in the same or different areas than that of the musicians who are playing the music?" "Science in Harmony" presentation with films by astronomer and visual artist, Dr. José Francisco Salgado and KV 265. University of the Sacred Heart Science Festival, San Juan, PR, 21 Mar 2013. Collaboration with College-Conservatory of Music Dance Department, Cincinnati, OH, Dec 2015. At the shooting of the Beyond Pluck Christmas Wonderland video, Cincinnati College of Music, Nov 2014. Paula warming up for Beyond Pluck's first concert as part of the Southwest Michigan Symphony's Casual Classics Series. Heritage Museum & Cultural Center, St. Joseph, MI, 7 Jun 2012. Rachel warming up for Beyond Pluck's premiere performance in St. Joseph, MI, 7 Jun 2012. Performing at the Interim Meeting of the Neurosurgical Society of America. Adler Planetarium and Museum, Chicago, IL, 15 Sep 2012. Educational program in collaboration with Dr. José Francisco Salgado. Eastside Connections School, Niles, MI, 5 Oct 2012. The stage is set for "Science in Harmony" presentation with films by Dr. Salgado and KV 265. University of the Sacred Heart Science Festival, San Juan, PR, 21 Mar 2013. Video shoot, Nashville, TN, May 2014. Video shoot, Franklin, TN, May 2014. © 2012-2016 Beyond Pluck. All rights reserved. Photography by Titilayo Ayangade, Nayt Cochran, and José Francisco Salgado.